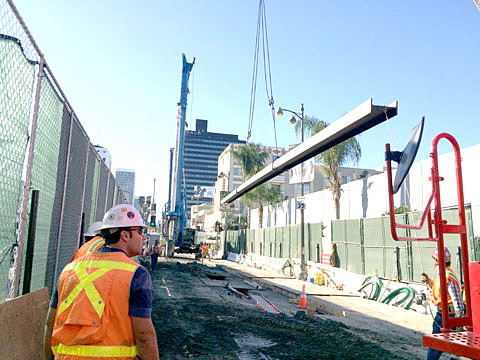 METRO WATCH 2023: Contractors prepare to place and install a steel beam or “soldier pile” that will support the walls and decking of the future Wilshire/La Brea Purple Line station. Traffic data for a proposed 22-weekend work schedule and a seven-week alternative for installing the La Brea station decking for Metro’s Purple Line will be discussed at a community meeting Thurs., Jan. 21. The meeting is at Los Angeles High School, 4650 W. Olympic Blvd., in the Corwin Theatre, from 6 to 8 p.m. The proposed seven-week scenario was suggested to alleviate traffic during installation of a temporary Wilshire Blvd. roadway surface, between Orange Dr. and Detroit St., for use during the years of underground station construction. Metro’s contractor has taken traffic counts at more than 12 locations, during weekday, weekend, peak and nonpeak hours, and is analyzing detour routes as well as signalization changes, signage and mitigation requirements. The Purple Line extension will add nine miles of subway with seven new stations ending at the Westwood/VA Hospital, west of the 405 freeway. The current work is part of the first, 3.9-mile, segment. In addition to La Brea, this segment includes stations at Fairfax and at La Cienega. See a video on the project here.